In 18th-century Ghana two sisters were born in different villages to the same father, but unaware of each other's existence. One marries an Englishman in the slave trade and lives in a palace; the other is captured and brought to America as a slave. 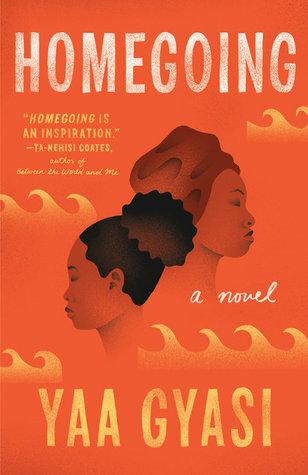 Homegoing follows these sisters and their descendants through several generations to the present day (or close to it.) It's been a pretty popular books and nominated for several awards. The writing is beautiful, and Gyasi does a wonderful job of bringing the reader into each time and place. With all these settings, that can't have been easy. She must have done a ton of research to get it all just right, and I'm no judge of accuracy but it sure felt right. It's very impressive, especially for a debut. Interestingly, she focuses a lot on how Africans were complicit in the slave trade. I don't think this is discussed much (at least I wasn't very familiar with this aspect of history), but I guess in the US our education about slavery tends to be focused on slavery here, not what brought the slaves here. Of course, this is only in the early chapters, as the later stories bring in other themes and issues that were more relevant to those time periods. The thing about this book is that each chapter is about a different character, and this is where it fell short for me. It reads more like a collection of connected stories than a novel, which is fine if that's your thing, but I found it frustrating. Every time I became captivated by a character and their story, the chapter would end I'd be transported to another continent, and another time period. It felt like a lot of jumping around, and a lot of characters since each main character also came with a full cast of family members, friends, and other people who showed up in their stories briefly and then were forgotten again when it jumped ahead another twenty years. Sometimes a character would reappear, but by then I couldn't remember who they were and what I knew about them, only that the name was familiar. As much as I can appreciate this novel and admit that it's very well crafted, I can't say that I enjoyed it as much as I had hoped. I read Homegoing for my 2017 Personal Reading Challenge and also my library's community read committee, thus killing two birds with one stone. Have you read this book? Did you like it more than I did? I feel so conflicted about it!